For upcoming draft, see 2019 NFL Draft. 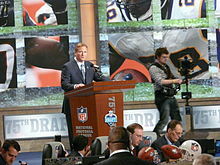 The National Football League Draft, also called the NFL Draft or the Player Selection Meeting, is a one time event which serves as the league's most common source of player recruitment. The basic design of the draft is that each team is given a position in the drafting order in reverse order relative to its record in the previous year, which means that the last place team is positioned first. From this position, the team can either select a player or trade their position to another team for other draft positions, a player or players, or any combination thereof. The round is complete when each team has either selected a player or traded its position in the draft. ^ Draper, Kevin (14 February 2018). 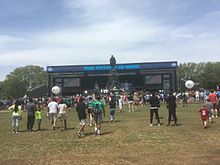 "Fox to Broadcast N.F.L. Draft for First Time". The New York Times. Retrieved 14 February 2018. ^ Lynch, Tim (2018-12-30). "Update: Broncos will likely pick 10th in NFL Draft after clarification on tie-breaking scenarios". Mile High Report. Retrieved 2019-01-06. 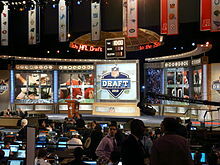 ^ "The rules of the NFL Draft | NFL Football Operations". operations.nfl.com. Retrieved 2018-12-31. ^ "Teams will have to get down to business with less time for picks | NFL.com". www.nfl.com. Retrieved 2018-12-31. ^ "Rivers Trade Dead? Draft Intrigue Begins at No. 2". SI.com. Retrieved 2018-12-31.